Hibiscus syriacus Pink Giant 'Flogi' is a medium growing, hardy, deciduous shrub with a rounded habit suited for borders. 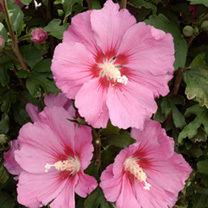 It has large, dark-pink flowers with a red centre produced late summer on the ends of young shoots and medium green foliage. It is tolerant of coastal weather. Height 200-250cm. Supplied in a 3 litre pot.